My Minerva make this month shows that sometimes old goes with new. I always get inspired by people who can match old and new in their homes, there are often brave choices but the people who get it right really do make an impression. My besie has a modern kitchen with a painted pine bookcase and an art deco sideboard and it all looks fab. So Jo, what is your point? My point is, I made the view 4 mini skirt from my vintage go-to-skirt-pattern and finally caved in to buy the coco pattern from Tilly and the buttons to make a great outfit. See, old and new. It is so easy to wear with thick tights and boots. I made the wool skirt from a house clearance remnant (thanks Caroline) and the top is made from Ponte Roma from Minerva. The pattern piece for the funnel neck did not have a grainline so I cut it on the grain with the rest of the fabric as the layout instructions showed but it was all twisted so I took it off and cut another one on the bias with a fold. It used lots of fabric but the collar is perfect now. The skirt is lined but I love using bias tape to hem a skirt in a wool fabric because there is only one fold then and it gives a flatter finish. I made deep cuffs for an interesting sleeve finish. Strange face on that one! Thanks Minerva, that was lovely quality Ponte Roma jersey. This is also my first Vintage pledge make for 2015 hosted by Stitching Odyessy. Got my March one nearly ready to go too. So did you like the trousers in episode one of The Great British Sewing Bee? White tree fabrics sent me this gorgeous Liberty print called Wiltshire which is a cotton lawn ideal for lightweight summer trousers. I saw a free pattern attached to Sew home & Style magazine in the March issue and it looked quite perfect. The whole magazine was great actually. My lovely neighbour bought me the February one for my birthday and I was lured into getting the following edition. They don't have a waistband, I used bias binding on the top of mine. There is an invisible zip on the side so the front is smooth. So get out to a newsagents/supermarket, grab the magazine and free pattern, dust off your machine and choose your favourite Liberty print. Morning Folks...You may have noticed that my tag line is 'I make something everyday' and indeed I truly do. Sometimes it is a completed project and other days, when parenting and work are my priority, I might just add a few more rows to a cardigan or another square to a blanket. The thing is I just can't go to bed unless I have made something. Some days I grow something, cook something, fix or mend something, make a card or a present, finish some big project or just make a start on a new one. The key for me is just to enjoy 'making' 'tis what I do best! So here is my little make from February which I did not show before because it was a secret and my bloke reads my blog at lunchtime! 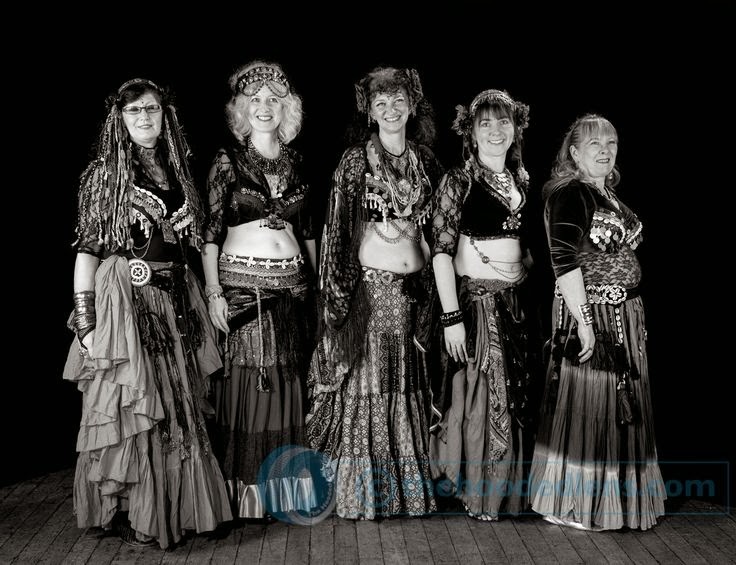 You may already know that I am in a tribal belly dance group, The Severn Sisters. Severn, as in the River Severn in Shropshire. Sometimes there are seven of us, but not always! Our usual kit normally consists of lace tops and lots of hip layers, basically, more is more. Sometimes we dance at festivals and local events. Can you possibly imagine having your belly out in this weather? We danced once in Ironbridge on a pouring wet day and we were all freezing. So there was a request from the Sisters to make a dance dress to keep us cosy but still feeling beautiful. We saw some on our favourite tribal group Black Veil. The pattern comes from an unlikely source. It is the pattern I used for my pyjama top. I tried to take it in at the waist side seams and sleeves. I lengthened it, then spilt up the sides so we can tuck our skirt frills over our hip belts. This is a prototype that took two hours last week to whizz up on the overlocker in stretch, crush velvet. I needed to do a bit more work to get some of the wrinkles out. I need to make it tighter or eat more cake but I am nearly there. I think this photo perfectly illustrates my dressmaking fitting issues. My backside is never in the same size as my waist fitting and I am short in the back with a sway too. In the end, I used two front darts and two back darts to make the body smooth. This is it without skirt frill tucked in and it certainly is warm. Tomorrow night we are dancing so I hope it works out OK.
"Always dance like nobody's watching..."
Hooray! I made it. I challenged myself. It was a new year craft resolution. I said to my own brain, if 95 other people on ravelry have worked this out then I can too. It was a challenge but it was enjoyable, if that makes sense. I loved the way it changed every week to a different pattern. There was no boredom, just fun! I made the waist with deep elastic. Measured a loop of elastic to fit my waist, folded it into quarters and marked the points. Then marked the quarter points of the skirt waist and used a stretch stitch on the machine to apply it, stretching the elastic to the skirt as I sewed. In all honesty, it is a bit too big. The pattern is in multiples of 12 so I would take 12 off next time but with only a chart pattern written by a Russian woman that had absolutely no dimensions on, I struck pretty lucky. Did I forget to mention I LOVE it! I was too busy being analytical there for a moment. I feel like Joni Mitchell every time I wear it. So would you wear one? Would you wear one without a petticoat? Later this week I have a photo diary of my skirt in the making to help along anyone who wants to give it a go. I miss making it already. Hello... I thought I would bring you a round up of how the cabin is building up it's own style. My Aunt and Uncle are visiting this week and they follow my blog so we are all going for a relax there this week because they have never been. I bought six dessert bowls and one big bowl, all Wedgwood and matching, from an antique shop last week for £14.50. Bargain, now we don't have to eat teeny portions of pasta and cereal from plastic ikea bowls. YAY! Bloke rigged up some great lamps from a solar panel for the girls to read, they actually play dentists under the bottom one! Crochet blankets are a must at this time of year. I sit under one while I make another one. Not sure what to do with the corner cupboard, haven't had any inspiration as yet but a moment will come one day, I'm sure. The fire gets so hot we have to open the doors most times we are there but the girls love to sit close and get cosy. The bedding is holding up. I left all that there this winter but I wasn't really sure how damp it would get but it has been fine. I love my first quilt, I put all my heart and soul into that for Little M.
So tropical inside, frosty outside. Perfect! Yep, still loving the cabin even in February. There isn't a lot else to do in the my least favourite month of the year, we all feel really grateful and very lucky. I normally say hooray! but that is not enough for this one so ta dah! I have to keep walking into the spare room to smile at it and I keep making the little ones look at it too. Their acting skill at saying the word 'Wooowww!' is starting to wear a bit thin but they have continued to humor me all week. I could not do the whole quilting thing. My machine aperture was just about big enough to get five vertical stripes to sandwich everything together. I didn't want to spoil it with bad quilting because it is the colour and patchwork that I wanted to shine. I made a bias binding last Sunday and then machine sewed it on Monday. Next I hand sewed, yes folks by hand, I sewed the other side of binding on the back. I have visitors staying for the week next week so my sewing/spare room will be resting but I think I am all done for a while on the machine, I am a bit sewed out. On the plus side, I have an empty drawer where all these scraps used to live and an heirloom bed quilt which I have always wanted to make. A collection of scraps from sewing projects, bloke's old shirts, my pyjama bottoms, given fabric pieces, girl's too small summer dresses and one Tilda charm pack. Total cost,in money, not hours! £42 ($64)for wadding and border fabrics. There is a story behind the jacket but that is for another day. I will continue to waft in and out of the room taking a peek to see that it is all smooth for the rest of the weekend. My second pair of Seaspray slippers. The pattern is on ravelry HERE. My crochet group made them, it took them two weeks but we got there in the end. I inadvertently ended up with another pair as I was demonstrating the clusters to six different people. The yarn is Sirdar Folksong, I used two balls. A soft chunky yarn, perfect for watching TV and crocheting in. Little M said, "is that wool called 'jungle'?". How clever I thought. It's not, but it should be. I made sure this time that I started each slipper on the same colour run of yarn to get matching slippers. See my first pair HERE. My favourite type of crafting will always be making something out of nothing. I can get real satisfaction from that. Although I must say that having a job over the last four months has made me think a little more about how I use my craft time. It has also brought home the feeling that my frugal crafting of the last five years was fun but it is also great to have a few pounds to spend on good materials. You know what I am pondering; Ying or yang, time or money. So when I needed to clear my desk to work. I got a bit excited about all the tat on it. Mostly bits of interesting packaging from my birthday presents that I didn't want to throw in the bin. I made some cards for my card storage box and cleared my desk at the same time all in about an hour. did get some lesson plans written, honestly! I need you to use your visualising techniques today and imagine what these four squares will look like repeated over the whole bed. Pretty awesome I am imagining. What are your thoughts? I will need to turn the bottom right one round. I had a little plan for this quilt, just cutting sizes for fabric quantities really so at every stage of this quilt I get a little more excited about the outcome. I am not following a pattern, picture or design, it is just happening and that feels very good indeed. The spotty fabric is by Rose and Hubble and is the best quality cotton, it presses so well. A Sunday morning border cutting session finished the last of the fiddly cutting so I was ready to go this week in little pockets of time here and there. Right, I am off to order a pack of green wadding made from recycled plastic bottles because I'm feeling like the next stage is coming fairly soon.